Either way, they'll be set for an early start. Tee-off times have been brought forward to 7.30am local time (12.30 Irish time), with the leaders going out at 9.20 (2.20), due to impending storms. "I put myself there with chances on the back nine on various Sundays and just haven't done it," said Woods. "Hopefully I'll get it done this time." What a story that would be! After a third-round 67, he is on 11 under par, level with Tony Finau and two strokes behind the reigning Open champion, Francesco Molinari, on a leaderboard which has remained simply superb. And the Italian is a deserved leader, having carded 14 birdies and only one bogey in 54 holes. Quality putting has always been hugely valued around here, and Molinari is unquestionably a wizard with the blade. Making him all the more formidable, however, is that he has driven the ball beautifully in this, his eighth Masters start. Confronted by such brilliance, Rory McIlroy was pushed totally out of touch. "Too many mistakes," he said after carding a second successive 71 to be one under, overall. "Too many mistakes," he said. "I just didn't have my A-game this week." His lone moment of real sparkle came on the 530-yard 15th where a splendid, six-iron approach of 225 yards was followed by an eight-foot putt for an eagle three. By that stage, however, too much damage had been done on a dispiriting outward journey of baffling contrasts. All the while, his body language was a world removed from the calm confidence of his recent Players Championship triumph. It was somewhat perverse that finishing holes which blunted his challenge on the opening day should have hurt him again. 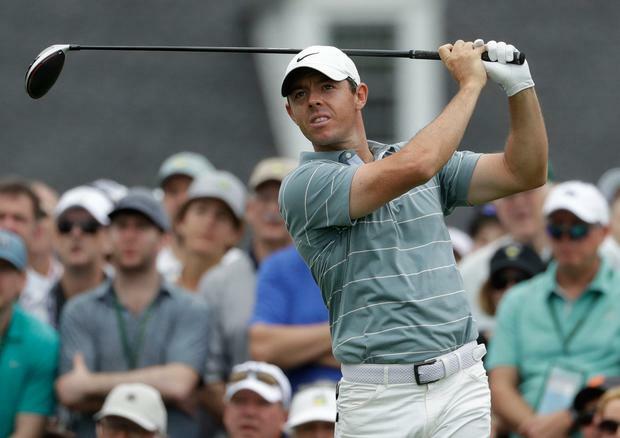 He finished with a bogey on the last, where he was twice bunkered, and not even McIlroy at his most dynamic, could afford to concede that sort of headway to such an array of gifted front-runners. All of this was set against the spectacle of the modestly talented American, Patrick Cantlay, sweeping from a starting position of two over to be right into contention with a 64. Course vulnerability was also evident as Ryder Cup player, Finau, blitzed the outward journey in 30 strokes, to equal the Masters record for the stretch. Then came another round of 64 by Webb Simpson when he, like Cantlay, failed to birdie the 18th. "I felt I needed a special round to get back in it," said the 2012 US Open champion. Then Finau matched his round through wonderful driving on the back-nine. By comparison, Shane Lowry's departure on Friday set the mood for what has become a fairly bleak Masters from an Irish standpoint.